Change-Diapers received this as an ezpz ambassador gift. If you click & buy, we may receive a small commision, thank you. Have you heard of ezpz mats? If you haven’t, you’re totally missing out. When I first saw this product I was blown away, but wasn’t sure if we would actually get one since our kiddos are older. But, what my sweet little 2-year old has taught me is that it’s never too late to prevent food messes! Ezpz has several cool products in lots of great colors. The Happy Mat is the largest, but they also have a Mini Mat, Happy Bowl and Flower Play Mat (great for arts and crafts like painting). Micro mats can be used for play, as a clean/quiet sensory fidget or even to introduce new foods. We received the Happy Mat in gray along with a Making Mealtime ezpz book. The book is a great tool for us since it gives us great ideas for different foods that are healthy, easy and fun. It has really cool food art you can create, and it’s very straighforward telling you exactly what you need with detailed directions. It also gives some great tips for picky eaters along with some pointers to help you include your kiddos in the kitchen prep. The ezpz products are all-in-one placemats plus a plate/bowl that are made from high-quality silicone. The best part: it suctions directly to your table, making it difficult (even impossible) for your little one to tip it over and spill food. The design with the placemat and plate helps to catch most of your kid’s mess, and if you have multiple children, you can easily stack 3-4 mats with food inside to be carried. 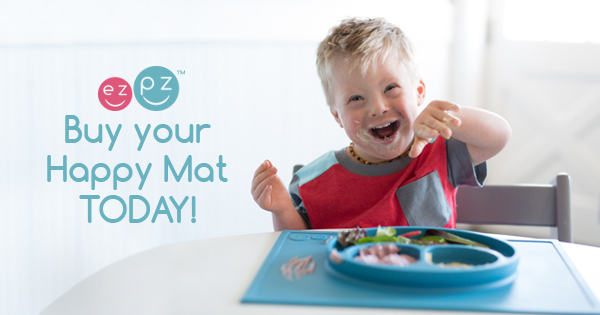 The mat helps promote self-feeding and develops fine motor skills, is easy to clean with warm soapy water and the silicone doesn’t support the growth of fungus, mold or bacteria! The mats are also dishwasher, microwave and oven safe, which is very convenient. The silicone is BPA, BPS, PVC and phthalate-free, easy to store, and built to last since it is bendable, flexible and won’t fade, corrode or deteriorate. I wasn’t sure if my kids would be “too old” for this, but we seem to still end up with lots of messes so it’s come in handy! My kiddo is loving the mat but is so angry that he can’t pick it up, which I find kind of amusing. I slapped that sucker on the small kids table we have and tried picking it up. I picked up the entire table without the mat coming undone! I had both kids try picking it up as well and neither were successful. It’s very easy to clean and I love that the eyes and mouth make it simple to portion food. Both eyes are 4 ounces and the mouth is 10 ounces. Even my five year old enjoys using it, so even if you have a bigger kiddo, it’s still a great product to have! Note from Maria: I met the ezpz owner at the ABC show and I was so impressed by how kind & down to earth she is. The adorableness of these micro mats nearly killed me and I got to see a brand spanking new product that is coming very soon, and about which I am very psyched. Cannot wait to actually try it myself and tell you about it! I don't know why I love tiny stuff so much but oh my gosh these @ezpzfun tiny miniatures!!! I see something else awesome that I can't tell you about yet! Shop ezpz or find an ezpz retailer. Have you used ezpz mats? Which is your favorite style? What other products would you like ezpz to produce?